Van Helsing took the first swing last week and didn't quite clear the fences, but $51.7 million is a good way to start the summer movie season. This weekend brings a film much more likely to knock one out of the park in its opening weekend. 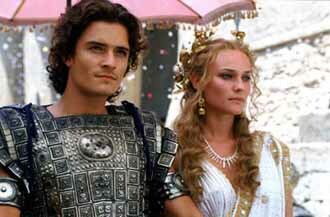 Homer's epic poem, The Iliad, is brought to the big screen in the form of Warner Bros' Troy, starring Brad Pitt, Orlando Bloom, Eric Bana and Diane Kruger (also known as Keira Knightley '04). For the uncultured out there, the Trojan War began when Prince Paris of Troy stole...oh, you just want to see the battle scenes, right? Director Wolfgang Petersen's film (his first since 2000's The Perfect Storm) has brought that in spades, complete with tons of CGI. For an actor whose fame and name recognition probably rank in the top five, Pitt has had remarkbly few hits in the last several years, with only Ocean's Eleven cracking $100 million since Se7en did it in 1995. Compare that with co-star Orlando Bloom, who has only been in four $300 million grossing films in the last three years. This hasn't stopped the big-time media blitz for Troy being focused almost exclusively on Pitt. Marketed out the wazoo, and providing plenty of bloody action, Troy is coming at the right time even if it's just a week after Van Helsing. An even bigger selling point is its historical factor ("Oh man, we've got that Greek Mythology final coming up! Let's go study by seeing Troy! "), and Pitt as Achilles seems a stroke of genius in casting. Troy looks to be the film to beat (at least until next weekend) with an opening weekend of around $58.7 million. Jamie Foxx heads up the weekend's other new release (yeah, there are two of them this weekend! ), Breakin' All the Rules. After being dumped, Foxx writes a book on dealing with it and it somehow becomes a best seller. The Screen Gems release isn't any different from the other urban-targeted films this year not called Barbershop, but the name recognition of Foxx is good for a couple million, and it figures to end up with about $8 million. Van Helsing performed respectably last weekend, and you can tell it's the summer movie season when you read a lot of movie reviews talking about how awful a film is, but the entire next week, friends and co-workers gush about how great and action-packed that same film is. Such is the case with the Hugh Jackman vampire movie. It's still in store for a more than 50% drop with about $24 million this time around. Proving there is still some justice in the world, the Olsen Twins more or less bombed with New York Minute, earning only $6 million. Can they finally turn 18 yet, or even better, can they just go away now? The movie's title is apt as that's about how much longer it has in theaters after a minimum 50% decline this weekend. We need those 3,000 screens for Shrek 2, girls. Mean Girls was able to hold pretty well in its second weekend, but it's not exactly leggy. Even still, it's definitely a breakout smash for Lindsay Lohan, and looks to be an option for those who want a little less testosterone in their movies during the rest of the month. The buzz limited film of the week is Jim Jarmusch's Coffee and Cigarettes. No more than numerous vignettes of famous people (playing themselves) talking while smoking and drinking coffee, just about all of us are going to have to wait until DVD to experience the surreal nature of it all.